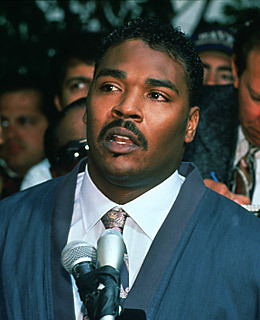 Rodney King pleads to the rioters to make peace May 1, 1992 in Los Angeles, CA. The riots left more than 50 dead, over 4,000 were injured and cost $1 billion in property damage. While driving down the 210 freeway in Los Angeles with two friends, Rodney King was detected speeding by the California Highway Patrol. Fearing that his probation for a robbery offense would be revoked because of the traffic violation, King led the CHP on a high-speed chase, eventually hitting 115 miles per hour, according to the police. By the time he was caught and ordered to exit his vehicle, several L.A.P.D. squad cars had arrived on the scene. A struggle ensued, and some of the officers quickly decided that King was resisting arrest. Sergeant Stacey Koon fired two shots into King with a TASER gun, and after that failed to subdue him, the officers, including Laurence Powell, beat him mercilessly with their batons. The incident was videotaped by a man named George Holliday, who lived nearby, and it didn't take long for the tape to send shockwaves around the world and enrage the already frustrated Los Angeles African American community, which felt that racial profiling and abuse by the police had long gone unchecked. Once the four officers accused in the beating were acquitted a year later by a predominantly white jury in the majority white suburb of Simi Valley, all that rage turned into the worst single episode of urban unrest in American history, which erupted on April 29, 1992, and before they were quelled a few days later, had left 53 people dead and $1 billion in damage. In the midst of the harrowing violence, King nervously uttered the phrase that would forever be synonymous with him and the riot: "Can we all just get along?" His sudden fame didn't make things much easier for King. He did win $3.8 million in damages from the City of Los Angeles for the beating incident, but much of it went into starting a rap record label, Straight Alta-Pazz Records, which soon folded. Over the next several years, he was arrested for various charges, including convictions for drunk driving and domestic abuse. He moved from Los Angeles to suburban Rialto to live quietly with his family. Over the years, King has refrained from talking to the press about the incident or his troubles, and there was no response to numerous interview requests by TIME relayed by intermediaries. "He was really desperately trying to rise above it and put the incident behind him," says his most recent attorney, Renee Campbell. "Rodney has this wonderful personality, he's always looking for the good part of life. He's simply a very nice man caught in a very unfortunate situation." His sister Ratasha says that through it all, King has managed to maintain high spirits, and that he is living once again in Los Angeles, helping to run a family-owned construction company and doting on his granddaughter. "He's doing well," she said. "We don't really talk about that whole thing. We did then, but we don't now."